Blood urea nitrogen (BUN) is a blood test performed as a marker of kidney function. It is part of the basic or comprehensive metabolic panel done for health screening. It is also used to monitor the progression of kidney failure. BUN is produced by the breakdown of protein and usually cleared from the blood by the kidneys. A higher than normal value may show impaired kidney function. What Is Blood Urea Nitrogen - BUN? BUN is a waste product of cell metabolism. You get protein from the food you eat, and it enters the bloodstream from the intestines to be used by cells throughout your body. Your cells break protein down into amino acids to build back up into the proteins they need for various processes. This produces nitrogen-containing ammonia as a byproduct, which is excreted it into the bloodstream. The liver transforms ammonia into urea to make it less toxic and sends the urea out into the bloodstream. Urea is filtered out of the blood by the kidneys. If all is going well, there is a continuous amount of urea being produced and being excreted by the kidneys into the urine. The BUN level in the blood is, therefore, stable. If the kidneys are damaged and not functioning properly, urea and the nitrogen it contains are not filtered fully from the blood. The purpose of the BUN test is to assess kidney function. It is also used to help diagnose kidney disease, to monitor the effectiveness of dialysis, and other treatments related to kidney disease or damage. What does the test measure: This test measures the amount of urea nitrogen in the blood. Urea is a waste product formed in the liver when protein is metabolized. This process produces ammonia, which is then converted into the less toxic waste product urea. High or low levels can indicate a problem: Diseases that affect the kidneys or liver can change the amount of urea in the blood. The liver may produce too much urea or the kidneys may not be able to filter the waste out of the blood, which can cause levels to be high. High levels can be seen in people who have gastrointestinal bleeding, high protein diets, infection, and dehydration. Significant liver damage or disease may inhibit the production of urea which can cause BUN concentrations to fall. Low levels of BUN may occur in people who have liver failure, woman who are pregnant, and to those who are overly hydrated. Underlying health conditions: Diabetes and high blood pressure are two types of conditions that may affect the kidneys. Therefore, BUN is collected to monitor for kidney health and effectiveness of treatment in those who already have established kidney disease. Before special tests: BUN tests may also be ordered to evaluate kidney function prior to some procedures, such as a CT (computed tomography) scan, that may require the use of drugs that can damage the kidneys. BUN is usually used in conjunction with a creatinine test: The BUN test is primarily used, along with the creatinine test to evaluate kidney function, as well as to monitor people with acute or chronic kidney dysfunction or failure. When ordered as part of a basic or comprehensive metabolic panel, it can be used to evaluate a persons general health. Limitations of the test: The BUN test is a fast way to evaluate kidney function, but there are some limitations. Small and large changes in BUN can occur from medications, dietary changes, and hydration status. Oftentimes when the BUN is out of range, physicians will refer to the creatinine clearance test or BUN/creatinine ratio for a more accurate assessment. You do not need any special preparation to take this test. Timing: This simple blood test is done in a few short minutes. A sample of blood is collected through a venous puncture. Location: This test can be done in a lab, office, or medical facility. Food and Drink: Most of the time this test is included in a basic or comprehensive medical panel in which people have been fasting. You do not need to fast for this test specifically, but your physician may have asked you to fast because of the other labs included in the panel, such as fasting blood sugar, which is a measurement of glucose control. Cost and Health Insurance: The BUN test is routinely covered by health insurance. The BUN test is part of the typical Chem 7 blood chemistry test or basic metabolic panel. This group of tests includes glucose, BUN, creatinine, carbon dioxide, sodium, potassium, and chloride. It is typical that this panel is run during health screenings and in monitoring diabetes management. They are all performed on the same tube of blood, typically analyzed in the lab in an instrument set up to test all of them at the same time. The normal range for BUN is 6 to 20 mg/dL, although the range may vary a little from lab to lab. Refer to the range for your lab. A high BUN may be caused by impaired kidney function, congestive heart failure, urine flow obstruction, shock, recent heart attack, dehydration, a high protein diet, or gastrointestinal bleeding. A low BUN is not common but can be found incidentally with malnutrition, severe liver disease, or in overhydration. Kidney failure is a complication of diabetes. The BUN (blood urea nitrogen) level in the blood is used to monitor the progression of kidney failure. BUN may also be monitored if you are given drugs that may impair kidney function. The BUN test is a simple blood test that is used to measure kidney function. Your doctor can order a BUN test for any person, even if they have no apparent symptoms or underlying conditions and the result turnaround is pretty quick. If you should happen to receive an abnormal result, the course of treatment for each person varies depending on the cause and severity. For example, elevated BUN levels that are caused by dehydration, indicate that a person needs to drink more fluids. More serious implications of abnormal BUN levels may result in additional testing or referral to a specialist. Be sure to discuss your results with your doctor. American Association for Clinical Chemistry. Blood Urea Nitrogen, Lab Tests Online. Laura J. Martin, MD, BUN - blood test, MedlinePlus. U.S. National Library of Medicine. National Heart, Lung and Blood Institute. Types of Blood Tests. What Are Creatinine Tests Used For? 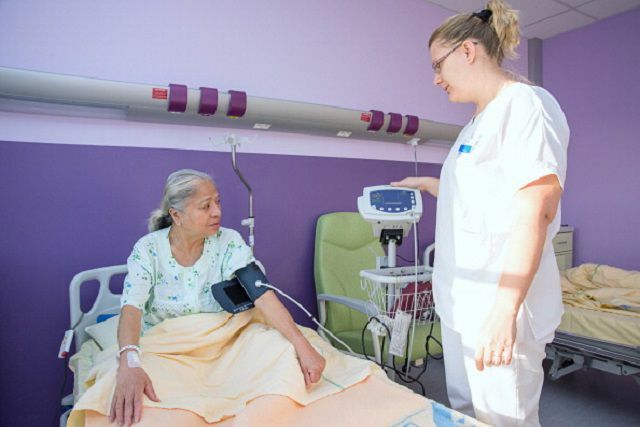 How Can My Doctors Tell If I Have Acute Kidney Failure? What Do My Urinalysis Results Mean? What Is a Urethrotomy and Why Is It Important? When Should You See a Kidney Doctor?